Amazonas Gifts presents a vibrant, colourful range of unisex t-shirts, from the iconic 'No time' brand. These are truly stunning! Unique designs printed on a high quality, comfortable, stone washed 100% Cotton t-shirt. Worldwide shipping, Free first class postage in the UK. A unique design showing the symbols of the Chakras set inside a geometrical pattern.There are 7 main Chakras which are aligned in an ascending column from the base of the spine to the top of the head.The function of the Chakras is to spin and draw in the energy to keep the spiritual, mental, emotional and physical health of the body in balance. A must have vibrant, premium quality 100% cotton T-Shirt with unique artwork.Made with love in Thailand..
A unique design showing the symbols of the Chakras set inside a geometrical pattern.There are 7 main Chakras which are aligned in an ascending column from the base of the spine to the top of the head.The function of the Chakras is to spin and draw in the energy to keep the spiritual, mental, emotional and physical health of the body in balance. A must have vibrant, premium quality 100% cotton T-Shirt with unique artwork.Made with love in Tha..
A vibrant, premium quality 100% cotton T Shirt with unique Bob Marley artwork. Made with love in Thailand by 'No Time' for Amazonas Gifts. Sizes Medium - Length 70cm x Width 52cm Large -L 73cm x W 54cm..
A vibrant, premium quality 100% cotton T Shirt with unique Bob Marley artwork. Sizes Medium - Length approx 70cm x Width 52cm / 27 Inch x 22 InchLarge -L 73cm x W 54cm..
A vibrant, premium quality 100% cotton T-shirt with unique Bob Marley artwork.Made with love in Thailand by No Time for Amazonas GiftsBrand - No TimeColour - Blue (Dark/Navy) (Stone wash) Size - M - 70cm x 52cm, L - 73cm x 54cm.. This great print of Bob Marley pictured with his long dreadlocks blending with the rasta colours.A must have vibrant, premium quality 100% cotton T-Shirt with unique artwork.Made with love in Thailand by 'No Time' for Amazonas GiftsSizesMedium - Length 70cm x Width 52cmLarge -L 73cm x W 54cm XL -L76cm x w 58cm.. This great print of Bob Marley pictured with his long dreadlocks blending with the rasta colours.A must have vibrant, premium quality 100% cotton T-Shirt with unique artwork.Made with love in Thailand by 'No Time' for Amazonas GiftsSizesMedium - Length 70cm x Width 52cmLarge -L 73cm x W 54cm .. This great print of Bob Marley pictured with his long dreadlocks blending with the rasta colours.A must have vibrant, premium quality 100% cotton T-Shirt with unique artwork.Made with love in Thailand by 'No Time' for Amazonas GiftsSizes - We only have Medium size left in stock.Medium - Length 70cm x Width 52cmLarge -L 73cm x W 54cm ..
A unique design showing the symbols of the Chakras inside a colourful love heart mandala. There are 7 main Chakras which are aligned in an ascending column from the base of the spine to the top of the head.The function of the Chakras is to spin and draw in the energy to keep the spiritual, mental, emotional and physical health of the body in balance. A must have vibrant, premium quality 100% cotton T-Shirt with unique artwork.Made with love in Th..
A unique design showing the symbols of our Chakra tree. There are 7 main Chakras which are aligned in an ascending column from the base of the spine to the top of the head.The function of the Chakras is to spin and draw in the energy to keep the spiritual, mental, emotional and physical health of the body in balance. 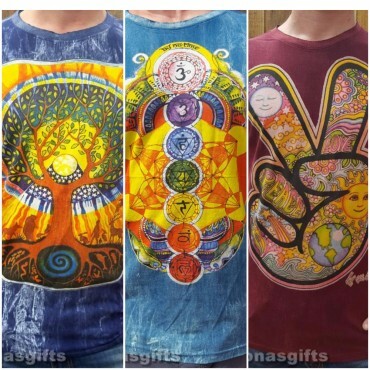 A must have vibrant, premium quality 100% cotton T-Shirt with unique artwork.Made with love in Thailand by No Time for Amazona..
A unique design of the symbols of our Chakra tree. There are 7 main Chakras which are aligned in an ascending column from the base of the spine to the top of the head.The function of the Chakras is to spin and draw in the energy to keep the spiritual, mental, emotional and physical health of the body in balance. A vibrant, premium quality 100% cotton T Shirt with this unique design.Made with love in Thailand by No Time for Amazonas Gifts.Siz..